North Korean state media have published images of Christmas worship in the isolated country in an apparent effort to rebut U.S. accusations that it suppresses religion. 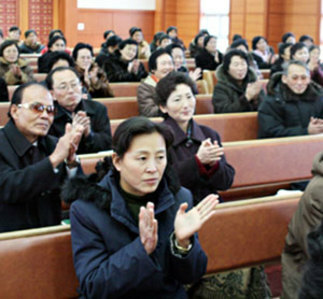 Ryomyong, a website run by the North's National Reconciliation Council, on Wednesday reported on Christmas worship at the Bongsu and Chilgol churches in Pyongyang. "Prayers were said... wishing that the hard-won mood of peace on the Korean Peninsula wouldn't be disturbed by Satanists' obstructive maneuvers," it claimed. "The religious freedom is certainly legally guaranteed in our republic," another post said. "Why is the U.S. haughtily presumptuous as if it were 'an inquisitor?'" Earlier, the North's Korean Council of Religionists sent a Christmas video message to South Korean churches. "Massive arms buildup and dangerous military exercises in South Korea are an apparent attempt to stand up to the North behind the façade of dialogue," the website added. North Korean propaganda media have launched a new campaign of denunciations of the South Korean media as denuclearization talks came to a standstill.